In this week’s edition of the Heartbeat Blog, we will continue to discuss our upcoming lecture series on “Assisting Residents with Heart Disease and Promoting Heart Health.” Today’s discussion will focus on the difference between a heart attack and cardiac arrest. It is important to know that one can lead to the other—a heart attack can cause cardiac arrest if untreated and severe—, but they are not synonymous. Heart attacks are scary, and we all know that you need to seek immediate medical attention if you are having one. But do we do CPR on someone having a heart attack? How do I know when to do CPR? Even though they sound like the same thing, it may surprise you to find out that a heart attack and cardiac arrest are two different things. It’s important to know how to tell what is going on, because the treatments are also different; administering the wrong treatment can cause immediate death. To find out the difference between an heart attack and cardiac arrest, let’s start by going over what a heart attack is. Heart attacks occur when an artery that brings blood to the heart is blocked. This means that blood cannot actually get to the heart. If the clogged artery doesn’t get fixed quickly, heart muscles can begin to die. Heart attacks can be mild to very severe. If a smaller artery is blocked a person can survive, especially with prompt treatment. They may complain of chest pain, difficulty breathing, sweating, nausea, jaw or shoulder pain, and many other symptoms. All of these can be symptoms of a heart attack. The person, however, can still talk to you and tell you they are uncomfortable or having chest pain. These people should call 911 immediately and go to ER. These people do not need CPR! Their heart is still beating, just part of the heart is not getting enough oxygen. They need to get treatment ASAP to unclog the artery and restore blood flow to that part of the heart. Cardiac arrest occurs when the heart stops beating unexpectedly. The electrical activity in the heart is off, and the heart starts “quivering” instead of pumping. The “quivering” electrical activity is called an arrhythmia. When the heart quivers instead of pumps, it means blood is not getting to the brain or vital organs, and the person does not have a pulse. Quickly after the heart stops beating, the person will become unresponsive and stop breathing (or just gasp). Death will occur within minutes if the person does not get treatment. This is when we call 911 immediately, start CPR, and find an AED! Since the heart is not beating, it requires someone else to pump the heart for the victim: this is what CPR does. Chest compression pumps the heart for the victim until an emergency response team can get to you. Since the problem is with the electricity in the heart, an AED (automated external defibrillator) can sometimes fix the abnormal electrical activity in the heart. An AED can deliver an electrical shock to the heart that sometimes restarts the heart and gets it beating normally. 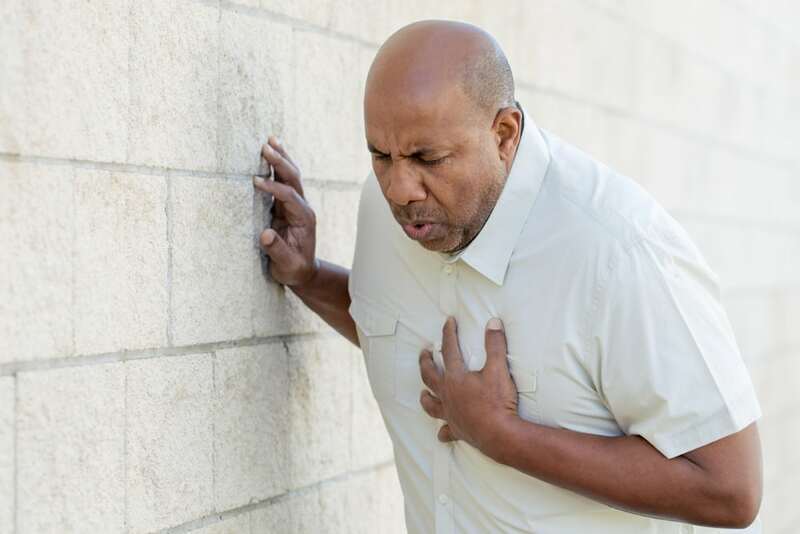 If someone is able to communicate and is complaining of chest pain, call 911 to ensure you get quick emergency treatment to unblock the heart as soon as possible. If someone passes out, has no pulse, and is not breathing, you need to call 911, start CPR, and have someone help you find an AED as soon as possible to get the heart beating again. If you find our series on heart disease to be helpful and informative, give us a call at 510-452-1100 to learn more about our continuing education courses for healthcare. Find out how they benefit, not just CNAs, but anyone interested in the medical field. We have Oakland and Sacramento campuses for your convenience, and are approved by the California Department of Public Health (NAC approved CE # 1187).